After struggling through their worst season in the desert two years ago, the Arizona Coyotes put together a decent showing last season. While Arizona’s 78 points in 2015-16 left them on the outside of the playoff picture for the fourth consecutive season, it was a 22-point improvement from their 2014-15 record. The Coyotes found their success last year through a combination of their young talent and the resurgence of veterans. Now, Arizona hopes that the mixture of youth and experience on their roster will boost them back into the postseason in 2016-17. The story going into last season for the Coyotes was the beginning of their youth movement, led by Max Domi and Anthony Duclair. Both Domi and Duclair were in Arizona’s top four in scoring during the 2015-16 season, while also placing in the top seven in scoring among all NHL rookies. 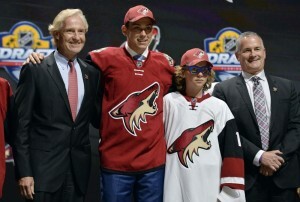 Last year was just the first wave of Arizona’s prospect pool to hit the ice in the desert. This season will see a sophomore Domi and Duclair possibly joined by either Christian Dvorak or Dylan Strome, if not both. Dvorak and Strome both finished in the top four scorers in the OHL last season and in the top six scorers during the OHL playoffs. Strome feels he is ready to make the jump from juniors while Dvorak will be in Arizona in either Glendale or Tucson. If Dvorak and Strome prove that they are ready this year, Arizona could get the extra push they need to bring playoff hockey back to the desert in April. In addition to the youth movement, the Coyotes also saw a pair of veterans bounce back last season. Shane Doan notched 28 goals in 2015-16, doubling his goal output from the previous season. The longtime Coyotes captain had one of his best seasons in the desert last year and will be back this season after signing a one-year contract during the summer. After struggling between the pipes two seasons ago, Mike Smith turned in a respectable 2015-16 campaign despite missing three months due to core muscle surgery. Smith dropped his GAA down to 2.63 (from 3.16 in 2014-15), the lowest it has been since he posted a 2.58 GAA in the abbreviated 2013 season. The Coyotes acquired some veteran talent during the offseason, including defenseman Alex Goligoski and forward Jamie McGinn. Following a 2014-15 campaign that was cut short after 19 games due to back surgery, McGinn put together his best offensive season last year with 22 goals and 39 points split between the Buffalo Sabres and Anaheim Ducks. Meanwhile, Goligoski comes to Arizona after putting together three consecutive seasons with at least 30 assists in Dallas. Arizona also added a familiar face to their lineup on Tuesday as Radim Vrbata officially signed a one-year deal to return to the Coyotes. Vrbata joins fellow Czech native Zbynek Michalek as they both are on their third stint with the Coyotes. Arizona has put together an interesting blend of potential breakout prospects and established, skilled players. As such, the Coyotes were able to said combination into a surprising first half last year, and now look to finish what they started heading into 2016-17.